Underfloor heating is becoming more and more popular in both domestic and commercial properties and even more so in new builds. 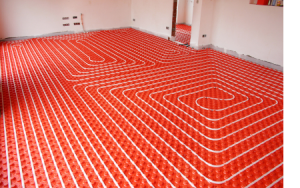 Underfloor Heating in your Bathroom, kitchen, bedrooms, living spaces or your office and work no matter where you want to install it, it is possible to install. Ideally it wants to be installed within an screed above insulated panels and then the whole floor becomes and nice warm and acts as a radiator at your feet just where you need it to be and convection heat can only rise. The better Underfloor floor heating systems are called wet systems as they use hot water heated by a boiler and this water is pumped to a manifold which could have just one zone or multiple zones. The water is then blended to a temp of around 40°C to ensure the floor temperature never gets to hot to cause harm to any one. The zones are controlled by room thermostats which can be very basic with just temp control or indeed really complicated with set back timers and day to day timing. The thermostats control actuators on the manifold which control the zones. As we pride ourselves in saying we are experts in the installation and maintenance of all types of underfloor heating we also offer the right advice for each individual system and explain this to you without any complicated jargon so you can rest assured that your using the system properly and get the most out of your system and gain the highest efficiency. It is also possible to retro fit various systems to be added to an existing floor giving all the benefits of Underfloor Heating with out all the building costs and upheaval to deal with. 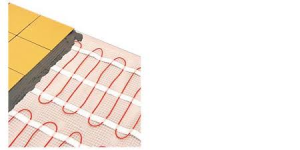 Also popular now is electric Underfloor Heating which is relatively ch eap to install in small rooms like bath rooms or cloak rooms but it is more expensive to run than wet systems fed by oil or gas boilers. Redecorate without restrictions with no radiators on the wall to worry about, you can furnish and decorate your home however you like, which makes it perfect for today’s open plan living leaving all your walls free.